My studies in science have strengthened my Christian faith. Actually, I studied the 2nd Law of Thermodynamics for the first time in a Bible study class. This law basically states that there is increasing entropy - physical systems are "running down." That is why my car door won't close properly. As I get older, my earthly physical body is declining. Physical matter and systems are not becoming more complex. There must be some power keeping the universe together. If this power or force is merely a physical system within the universe, it would be deteriorating as well. Since there is a deterioration process occurring, there must have been a beginning. Genesis 1:1 indicates that there was a beginning of the heavens and the earth. The Bible teaches that God is not only the Creator but also the Sustainer. The Bible also teaches that God is spirit. (John 4:24) God is infinite (He cannot be measured), omniscient, and omnipresent. I know that OCD feels so strong and powerful, but I also personally know that the power of OCD can be broken because God is more powerful. An excellent book titled How Now Shall We Live? by Charles Colson and Nancy Pearcey helps me to study science, the origins of ideas, and worldviews. I learn about the precise measurements and distances that are necessary to sustain life on earth. For example, the water on the earth would be inaccessible for our use if the distance between the earth and the sun were slightly different. There are many facts about atoms, such as the balance of charges between protons and electrons and the sizes of the atomic particles, which make it possible for the universe and life to exist. I have reached the decision that numerous scientific facts cannot be dismissed as mere coincidences. Intelligent design requires an intelligent designer. This intriguing book not only makes me think, but it also helps my problem with doubting. This book has many other interesting topics besides science - it is of immense benefit to me. I started to think more clearly and ask more questions within the Christian community. Because I have a history of OCD, I am interested in the distinction between the brain and the mind. As a Christian, I have the spiritual element to consider. Another reason why I liked the book Freedom From Fear; Overcoming Worry & Anxiety by Neil T. Anderson and Rich Miller is because it addresses both the spiritual and the physical components of the human being. I have many questions, but I do know for a fact that as my faith grows in Christ, my OCD is weakening. It is important to understand that Christianity is not a "quick-fix" - I am on a lifelong journey with God. I am thinking about how soft the petals of a flower feel. With my eyes, I see the delicate shape of the fragile tulip. With my heart, I sense the gentleness of God. The human body is so complex in design and organization that my Gray's Anatomy book contains 1257 pages. Even the minute-sized organelles within a cell have a special function and purpose. 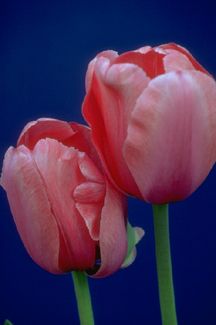 I have come to the conclusion that tulips and human beings have not just happened in some kind of haphazard, random manner because I clearly see the beauty and the intelligence of creation. I am a created being, and I cannot make something out of nothing. And my soul knows it very well." Were not these thoughts like lightning bolts striking my heart over and over. When I experienced obsessive thoughts, I use to wonder how can I flee from my own mind. Do not give any weight to these thoughts. When I pray and have trouble focusing, I will write my prayers. This may sound like a simple idea, but I find it to be effective. I desire to read my Bible because I am a seeker of truth. The truth will replace the lies that I have believed for so long. I am so grateful to Pastor Rod and Pastor Snapp for their guidance. I wonder about the silent depths of sadness. Tears form when I hear a solitary piano key being touched gently. When I look at Jesus and all of the suffering He went through for me, I sense an intermingling of beauty and sadness. Sometimes, I find myself in a place named the Psalms. I sin, but You forgive all of my transgressions. You are My God and My Deliverer.